The Royal Spanish Football Federation (Spanish: Real Federación Española de Fútbol; RFEF) is the governing body of football in Spain. It is based in La Ciudad del Fútbol of Las Rozas, a municipality near Madrid. It was founded on 14 October 1909 as Federación Española de Clubs de Football, and officially founded on 29 September 1913. It administers the competition committee (including the handling of the trophy) of the Campeonato Nacional de Liga: the Primera División and the Segunda División, even though they are organized by LaLiga. It organizes the Segunda División B as well as the Tercera División with the assistance of the regional football federations. It is also responsible for appointing the management of the Spanish national football team (men's), women's, and youth national football teams. The Spain national futsal team, also belongs to the federation. The RFEF consists of 19 regional and territorial federations, comprising the different Autonomous communities and cities in Spain. ^ EFE (7 March 2010). "Le quiere quitar cuatro títulos históricos al Madrid y uno al Barcelona". Marca (in Spanish). Retrieved 4 December 2010. ^ "Adidas presentó la nueva equipación de España". Real Federación Española de Fútbol (in Spanish). Archived from the original on 8 March 2012. Retrieved 4 December 2010. 2013 UEFA European Under-21 Championship was the 19th staging of UEFAs European Under-21 Championship. The final tournament was hosted by Israel between the 5–18 June 2013, the Israeli bid was chosen by UEFAs Executive Committee on 27 January 2011 in Nyon, Switzerland. This bid defeated the other bids from Bulgaria, Czech Republic, Spain defended the title they won two years prior, winning their fourth title after defeating Italy 4–2 in the final. The draw for the stage of qualifying for the 2013 UEFA European Under-21 Championship took place on 3 February in Nyon. 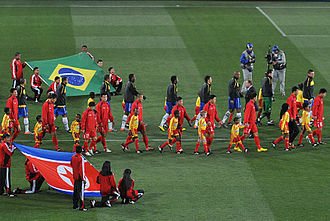 52 national teams took part in the qualifying, the group stage of qualifying began on 25 March 2011. There were a total of ten groups, consisting of five or six teams each, all the teams in each group faced each other two times, at home and away. The team at the top of group and the four best second-placed teams qualified to the playoff round. In the playoff round, the 14 teams were drawn to play seven two-legged matches, the winners joined Israel in the tournament finals. The draw for the tournament took place on 28 November 2012 in Tel Aviv. As the highest-ranked team according to the competition coefficient rankings, Spain are one of the top two seeds alongside hosts Israel and those two sides will be drawn into separate groups, as will the second and third-ranked teams in the list and the Netherlands. The remaining four countries are unseeded and will be placed in the positions in the two four-team sections. The deadline for the submission of the final 23-man squads was ten days before the opening match, the draw for the group stage was held on 28 November 2012 in Tel Aviv. The UEFA Technical Team was charged with naming a squad composed of the 23 best players over the course of the tournament, with eleven, have the most players in the team of the tournament. UEFA Team of the Tournament 4 goals 3 goals Thiago Isco 2 goals 1 goal The official ball for the UEFA European Under-21 Championship was unveiled during the draw in Tel Aviv on 28 November 2012. The ball has the blue and white colours as tournament hosts Israel and its design features the same thermally bonded triangular patterns as the adidas Tango 12. Madrid is the capital city of the Kingdom of Spain and the largest municipality in both the Community of Madrid and Spain as a whole. The city has a population of almost 3.2 million with an area population of approximately 6.5 million. It is the third-largest city in the European Union after London and Berlin, the municipality itself covers an area of 604.3 km2. Madrid lies on the River Manzanares in the centre of both the country and the Community of Madrid, this community is bordered by the communities of Castile and León. As the capital city of Spain, seat of government, and residence of the Spanish monarch, Madrid is the political, the current mayor is Manuela Carmena from Ahora Madrid. Madrid is home to two football clubs, Real Madrid and Atlético de Madrid. Madrid is the 17th most liveable city in the according to Monocle magazine. Madrid organises fairs such as FITUR, ARCO, SIMO TCI, while Madrid possesses modern infrastructure, it has preserved the look and feel of many of its historic neighbourhoods and streets. Cibeles Palace and Fountain have become one of the monument symbols of the city, the first documented reference of the city originates in Andalusan times as the Arabic مجريط Majrīṭ, which was retained in Medieval Spanish as Magerit. A wider number of theories have been formulated on possible earlier origins, according to legend, Madrid was founded by Ocno Bianor and was named Metragirta or Mantua Carpetana. The most ancient recorded name of the city Magerit comes from the name of a built on the Manzanares River in the 9th century AD. 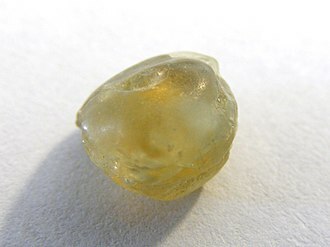 Nevertheless, it is speculated that the origin of the current name of the city comes from the 2nd century BC. The Roman Empire established a settlement on the banks of the Manzanares river, the name of this first village was Matrice. In the 8th century, the Islamic conquest of the Iberian Peninsula saw the changed to Mayrit, from the Arabic term ميرا Mayra. The modern Madrid evolved from the Mozarabic Matrit, which is still in the Madrilenian gentilic, after the disintegration of the Caliphate of Córdoba, Madrid was integrated in the Taifa of Toledo. The championship has been awarded every four years since the inaugural tournament in 1930, except in 1942 and 1946 when it was not held because of the Second World War. The current champion is Germany, which won its title at the 2014 tournament in Brazil. 32 teams, including the qualifying host nation, compete in the tournament phase for the title at venues within the host nation over a period of about a month. The 20 World Cup tournaments have been won by eight different national teams, Brazil have won five times, and they are the only team to have played in every tournament. The worlds first international match was a challenge match played in Glasgow in 1872 between Scotland and England, which ended in a 0–0 draw. The first international tournament, the edition of the British Home Championship. 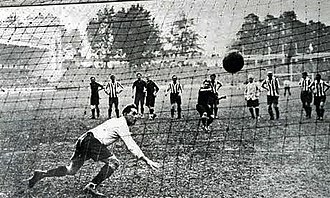 After FIFA was founded in 1904, it tried to arrange an international football tournament between nations outside the Olympic framework in Switzerland in 1906 and these were very early days for international football, and the official history of FIFA describes the competition as having been a failure. At the 1908 Summer Olympics in London, football became an official competition, planned by The Football Association, Englands football governing body, the event was for amateur players only and was regarded suspiciously as a show rather than a competition. Great Britain won the gold medals and they repeated the feat in 1912 in Stockholm. With the Olympic event continuing to be contested only between teams, Sir Thomas Lipton organised the Sir Thomas Lipton Trophy tournament in Turin in 1909. The Lipton tournament was a championship between clubs from different nations, each one of which represented an entire nation. Lipton invited West Auckland, a side from County Durham. West Auckland won the tournament and returned in 1911 to successfully defend their title, in 1914, FIFA agreed to recognise the Olympic tournament as a world football championship for amateurs, and took responsibility for managing the event. 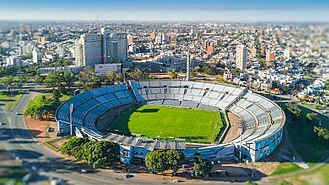 This paved the way for the worlds first intercontinental football competition, at the 1920 Summer Olympics, contested by Egypt and 13 European teams, Uruguay won the next two Olympic football tournaments in 1924 and 1928. The 2009 FIFA U-17 World Cup was the thirteenth tournament of the FIFA U-17 World Cup held in Nigeria from 24 October to 15 November 2009. The tournament was won by Switzerland, beating the host team 1–0, to be eligible to play, a player must have been born on or after 1 January 1992. 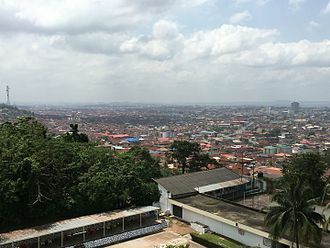 FIFA chose eight venues out of nine possible locations, on 21 May 2009, FIFA gave Nigeria a Yellow Card as FIFA noted a significant delay in the preparations for the tournament. While Abuja and Lagos were ready, FIFA Vice-President Jack Warner gave four other venues a month to get 100 percent ready or the tournament would be moved, one potential venue was removed after recent violence flared up in the Niger Delta. The 2009 edition was under increasing threats from the rebel group, The Movement for the Emancipation of the Niger Delta. However, the militants were offered amnesty in exchange for laying down their weapons, the group draw was held on 7 August 2009 at the International Conference Centre in Abuja. Teams were allocated to groups on the basis of geographical spread, teams were placed in four pots, and one team was drawn from each pot for each group. The 2010 FIFA World Cup was the 19th FIFA World Cup, the world championship for mens national association football teams. 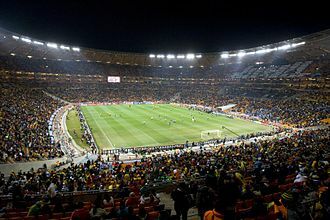 It took place in South Africa from 11 June to 11 July 2010, the matches were played in 10 stadiums in nine host cities around the country, with the final played at the Soccer City stadium in South Africas largest city, Johannesburg. Thirty-two teams were selected for participation via a qualification tournament that began in August 2007. In the first round of the tournament finals, the competed in round-robin groups of four teams for points. These 16 teams advanced to the stage, where three rounds of play decided which teams would participate in the final. In the final, the European champions, defeated the Netherlands 1–0 after extra time, as a result of their win, Spain represented the World in the 2013 FIFA Confederations Cup. Host nation South Africa,2006 champions Italy and 2006 runners-up France were all eliminated in the first round of the tournament and it was the first time that the hosts had been eliminated in the first round. New Zealand, with their three draws, were the undefeated team in the tournament, but they were eliminated in the first round. Africa was chosen as the host for the 2010 World Cup as part of a policy, abandoned in 2007. Five African nations placed bids to host the 2010 World Cup, Morocco, South Africa, following the decision of the FIFA Executive Committee not to allow co-hosted tournaments, Tunisia withdrew from the bidding process. The committee decided not to consider Libyas solo bid as it no longer met all the stipulations laid down in the official List of Requirements. 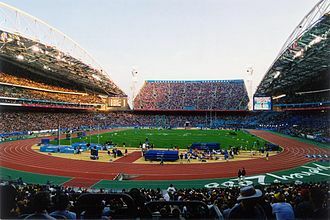 South Africa, which had failed to win the right to host the 2006 event, was thus awarded the right to host the tournament. Having successfully campaigned for South Africa to be granted host status, during 2006 and 2007, rumours circulated in various news sources that the 2010 World Cup could be moved to another country. Franz Beckenbauer, Horst R. Schmidt and, some FIFA executives, expressed concern over the planning and pace of South Africas preparations. 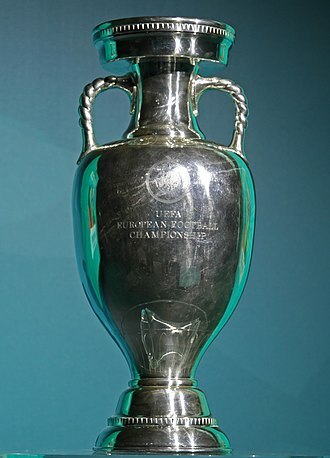 Held every four years since 1960, in the even-numbered year between World Cup tournaments, it was originally called the UEFA European Nations Cup, changing to the current name in 1968. Starting with the 1996 tournament, specific championships are often referred to in the form UEFA Euro, prior to entering the tournament all teams other than the host nations compete in a qualifying process. The championship winners earn the opportunity to compete in the following FIFA Confederations Cup, to date, Spain is the only team in history to have won consecutive titles, doing so in 2008 and 2012. It is the second most watched football tournament in the world after the FIFA World Cup, the Euro 2012 final was watched by a global audience of around 300 million. The most recent championship, hosted by France in 2016, was won by Portugal, in honour of Delaunay, the trophy awarded to the champions is named after him. 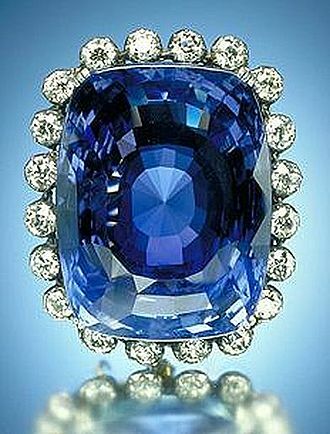 The 1960 tournament, held in France, had four competing in the finals out of 17 that entered the competition. It was won by the Soviet Union, beating Yugoslavia 2–1 in a final in Paris. Spain withdrew from its quarter-final match against the USSR because of two political protests, of the 17 teams that entered the qualifying tournament, notable absentees were England, the Netherlands, West Germany and Italy. The hosts beat the holders, the Soviet Union, 2–1 at the Santiago Bernabéu Stadium in Madrid. The tournament format stayed the same for the 1968 tournament, for the first and only time a match was decided on a coin toss and the final went to a replay, after the match against Yugoslavia finished 1–1. More teams entered this tournament, a testament to its burgeoning popularity, Belgium hosted the 1972 tournament, which West Germany won, beating the USSR 3–0 in the final, with goals coming from Gerd Müller and Herbert Wimmer at the Heysel Stadium in Brussels. This tournament would provide a taste of things to come, as the German side contained many of the key members of the 1974 FIFA World Cup Champions. The FIFA Confederations Cup is an international association football tournament for national teams, currently held every four years by FIFA. It is contested by the holders of each of the six championships, along with the FIFA World Cup holder. Since 2005, the tournament has been held in the nation that will host the FIFA World Cup in the following year, acting as a rehearsal for the larger tournament. However,2022 FIFA World Cup host Qatar will not host 2021 FIFA Confederations Cup as announced by FIFA in 2015 due to Qatars high temperatures during the summer period. This is the first edition, since the 2003 FIFA Confederations Cup, the reigning Champion is Brazil who won the 2013 FIFA Confederations Cup, by defeating Spain 3–0 in the final for a record fourth title. They will not be able to defend their title, as they were eliminated by Paraguay in a penalty shoot-out in the Quarter-Finals of the 2015 Copa América. The tournament was organized by and held in Saudi Arabia and called the King Fahd Cup, contested in 1992 and 1995 by the Saudi national side. In 1997, FIFA took over the organization of the tournament, named it the FIFA Confederations Cup, since 2005, it has been held every four years, in the year prior to each World Cup in the host country of the forthcoming World Cup. At the same time, participation was optional for the South American and European champions. Generally, the host nation, the World Cup holders, in those cases where a team meets more than one of the qualification criteria, another team is invited to participate, often the runner-up in a competition that the extra-qualified team won. On four occasions teams have not to participate in the tournament. In 1997, Germany were replaced by 1996 runners-up Czech Republic, and in 2003 they were replaced by Turkey, france,1998 World Cup winners, declined their place in the 1999 Confederations Cup, and were replaced by Brazil, the 1998 World Cup runners-up. Italy, UEFA Euro 2000 runners up, declined their place in the 2003 FIFA Confederations Cup, an earlier tournament existed that invited former World Cup winners, the Mundialito, or Copa de Oro which celebrated the fiftieth anniversary of the first World Cup. Association football is the most popular sport in Spain, and is a widespread passion among the people of Spain. In a survey of sports habits of the Spanish population made in 2010, a total of 75. 9% of people said they had ever bought tickets to attend a football match. In addition, a total of 67. 3% of the said that they saw all, almost all, many. In another survey made in 2014, the practice of football decreased to 14% of the population, being overtaken by other sports, however, in this survey football was still the sport that interests the majority of Spain’s people. A total of 67% of the said they were fans or had sympathy for a particular club. In addition,74. 9% said they watched, whenever possible, the matches broadcast on television regarding their favorite teams, a relationship between football, politics and attitudes towards regionalism in Spain has been reported. The Royal Spanish Football Federation is the governing body. The Liga de Fútbol Profesional, integrated by a total of 42 football clubs, forms part of the Royal Spanish Football Federation but has autonomy in its organisation and it is responsible for the organisation of state football leagues, in coordination with RFEF. The Spanish national football team have won the FIFA World Cup once, and has been successful in the UEFA European Championship, the mens national teams of Spain, in all categories, have won a total of 26 titles in FIFA, UEFA, and Olympic tournaments. The First Division of the Liga de Fútbol Profesional, commonly known in the English-speaking world as La Liga, is one of the strongest football league in Europe, at club level, the Spanish football clubs have won a total of 66 international tournaments. The characteristic football style of play developed by FC Barcelona, professional football in Spain is a sociocultural event that make a significant contribution to the Spanish economy in terms of both demand and supply. In economic terms, during 2013 professional football generated more than €7.6 billion including direct and induced effects, representing 0. 75% of Spanish GPD. Moreover, as a result of crisis in the last years. In addition, the European Union authorities have warned to Spanish authorities in order to halt funding of debt-ridden clubs. The 1950 FIFA World Cup, held in Brazil from 24 June to 16 July 1950, was the fourth FIFA World Cup. It was the first World Cup since 1938, the planned 1942 and 1946 competitions having been cancelled owing to World War II. It was won by Uruguay, who had won the competition in 1930. 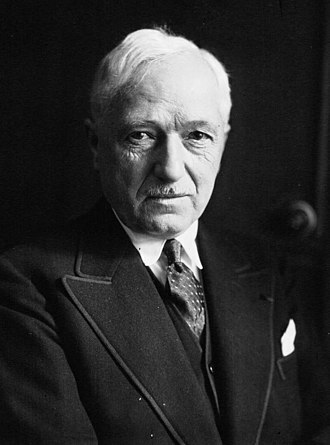 It was the first tournament where the trophy was referred to as the Jules Rimet Cup, because of World War II, the World Cup had not been staged since 1938, the planned World Cups of 1942 and 1946 were both cancelled. After the war, FIFA were keen to resurrect the competition as soon as possible, in the aftermath of the war, much of Europe lay in ruins. Brazils new bid was very similar to the mooted 1942 bid and was quickly accepted, having secured a host nation, FIFA would still dedicate some time to persuading countries to send their national teams to compete. The Italians were eventually persuaded to attend, but travelled by boat rather than by plane and Italy qualified automatically, leaving 14 places remaining. Of these, seven were allocated to Europe, six to the Americas, both Germany and Japan were not permitted to participate in qualification. The British nations were invited to take part, having rejoined FIFA four years earlier, after 17 years of self-imposed exile and it was decided to use the 1949–50 British Home Championship as a qualifying group, with the top two teams qualifying. England finished first and Scotland second, argentina and Peru in South America withdrew after the qualifying draw. This meant that Chile, Bolivia and Uruguay qualified from South America by default, in Asia, the Philippines and Burma all withdrew, leaving India to qualify by default. In Europe, Austria withdrew, claiming its team was too inexperienced, belgium withdrew from the qualification tournament. These withdrawals meant that Switzerland and Turkey qualified without having to play their round of matches. Before the qualification competition, George Graham, chairman of the Scottish Football Association, had said that Scotland would only travel to Brazil as winners of the Home Championship, Turkey withdrew, citing financial problems and the cost of travelling to South America. The 2009 FIFA Confederations Cup was the eighth Confederations Cup, and was held in South Africa from 14 June to 28 June 2009, as a prelude to the 2010 FIFA World Cup. The draw was held on 22 November 2008 at the Sandton Convention Centre in Johannesburg, the opening match was played at Ellis Park Stadium in Johannesburg. The tournament was won by Brazil, who retained the trophy won in 2005 by defeating the United States 3–2 in the final. The draw for the competition was held on 22 November 2008 at the Sandton Convention Centre in Johannesburg. Each team was represented in the draw by its competitor in the Miss World 2008 competition, except for Iraq, as result and Spain were drawn into different groups. The official match ball for the 2009 FIFA Confederations Cup was the Adidas Kopanya, the name means join together in Southern Sesotho, one of the 11 official languages of South Africa. The panel configuration of the ball is the same as that of the Teamgeist, the ball is white, accentuated with bold black lines and detailed with typical Ndebele designs in red, yellow and blue. World Cup champions parade, celebrate as they pass in front of the Air Force Headquarters in Madrid. Marta Torrejón is the most capped player in the history of the Spanish national team. Verónica Boquete is Spain's all-time scorer with 38 goals. 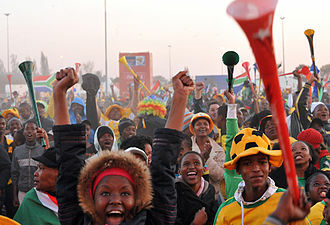 Supporters watching the 2010 FIFA World Cup in South Africa, with vuvuzelas. 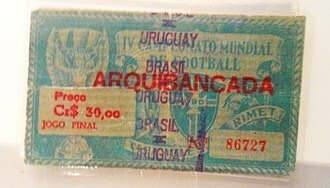 Ticket for the 1950 World Cup's decisive match between Brazil and Uruguay. Spain midfielder Xavi was selected as the Player of the Tournament. Hosts and tournament winners Belgium before the final. Internal view of the stadium in Belo Horizonte. A replica of The Adidas Kopanya (the official match ball of the 2009 FIFA Confederations Cup) with the traditional 32-panel structure. The official match ball has the same structure and surface as the Adidas Europass. 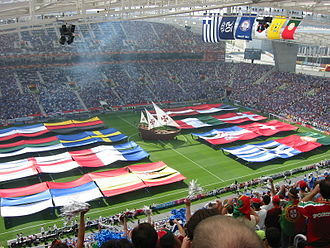 The UEFA Euro 2004 opening ceremony in Portugal. Players fighting for the ball during the match between Germany and Norway in UEFA Euro 2009 Women's European Championship in Tampere, Finland. Reception of Germany women's national football team, after winning the 2009 UEFA Women's Championship, on the balcony of Frankfurt's city hall "Römer"